If you have a cold bathroom, you know the frustration of freezing after stepping out of a warm shower, or the pain you get in your extremities when it’s just too cold. Shopping online is supposed to be easy, but it can sometimes leave you feeling just as bad. Manufacturers often overstate what their models can do and leave out any information about their products’ shortcomings. That can leave you frustrated after purchase, and leave you wishing you could get your money back. We believe that shopping online doesn’t have to be a frustrating experience that leaves you out in the cold. If you want to get a great deal on a model that works well, then you’ve come to the right place. Our reviews and buyer’s guide are designed to walk you through everything you need to know before you buy, so you can walk away feeling like you got a great deal. 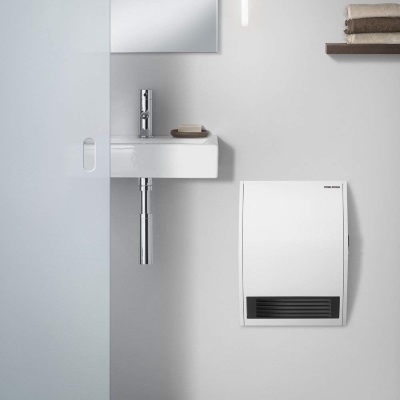 The Stiebel Eltron 074058 Wall Mounted heater is one of the best for bathrooms on the market today, by a long shot. It runs quietly, so you’d be hard-pressed to hear it while it’s on. Music, television, and even conversations would be louder than this model, so you may even forget that it’s running. It’s designed to direct air downwards, which is the opposite of most models. That has two benefits. The first is that it heats spaces very evenly. Since heat rises, heating the area near the floor first leads to a consistent temperature throughout the room. It also means that it heats quickly relative to other models. Since people generally live and work closer to the ground than the ceiling, heating that area first results in changes, you’ll notice faster. This model comes ready to tie into a central thermostat system, so you can set the room to heat to a specific temperature if you want. What keeps this model from perfection is its very visible electrical wire. If that were mounted more stealthily, the entire model would look better. As is, it works extremely well and would make a great addition to any cold bathroom. While the above choice might be the better pick if you have the electrical know-how to wire up a wall-mounted heater, that’s not knowledge that we all have. If you want a heater that requires no installation, then the Lasko CD08200 Portable Bathroom Heater is the model for you. While most heaters warn you away from bathroom use, this model explicitly okays it. It comes with an ALCI safety plug, which automatically turns the unit off if it detects an electrical imbalance, which means it’s safe to use around water. That feature alone makes this model a strong contender for the best space heater for bathrooms. It also comes with automatic overheat protect. That feature extends the life of the model by protecting its parts from unnecessary damage. It also heats small and medium bathrooms quickly and can take one of those rooms from frosty to comfortable in the space of a shower. What ultimately earns this model second place is the fact that it cannot be hooked up to a thermostat. That means you can’t get fine temperature control. Still, if you don’t want to do any electrical work, this is the best model for you. 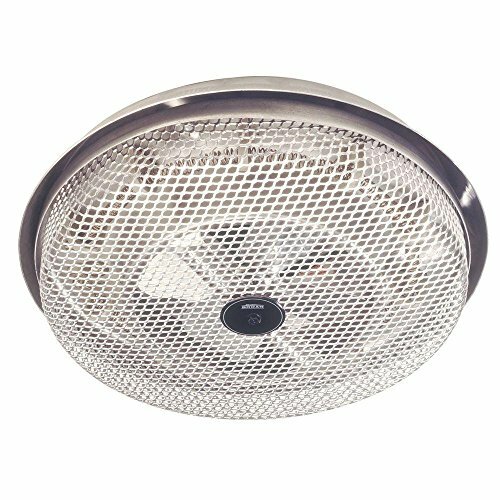 The Panasonic FV-11VH2 Fan Heater is a good choice if you’re looking for a model you can mount in your ceiling, making it an unobtrusive heater. This model is very quiet, even relative to some of the other models on our list. Since it’s mounted in the ceiling, far from your ears, it’s even less noticeable. It’s also designed for energy-efficiency, so if you’re looking for a model that can save you some money on energy bills, this is a good choice. It’s also designed to fit between beams in 2×8 construction, which means it will fit in many ceilings without any excessive modification. However, it works best in rooms with eight-foot ceilings or less. That’s not every bathroom, and while you could use it in a taller bathroom, you’ll get less heat out of it. It’s also a relatively difficult installation. While the layman could do it, it will probably be a long, frustrating experience. The first two models on our list go in much easier, so this one is certainly a pain relative to those two, due in part to bad instructions. Overall, this isn’t a bad choice, but you’ll probably need to spend extra for expert installation. 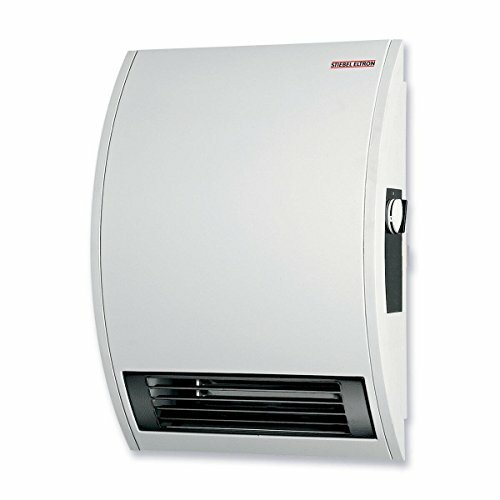 The best thing about the Broan Model 157 Bathroom Ceiling Heater is that it easily mounts to the ceiling. 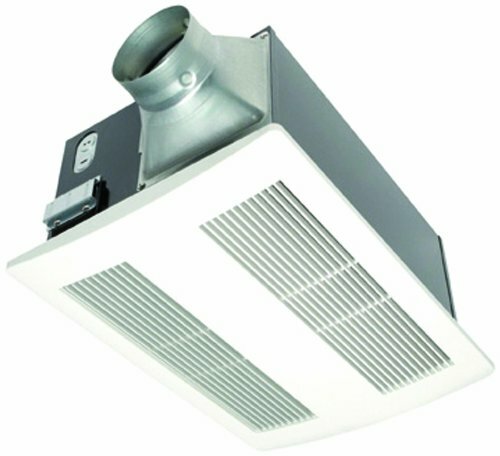 Other ceiling-mounted heaters require extensive installation processes, while this model can mount to a standard 3-1/2 or 4-inch electrical box, making it an easy and quick installation. If you’re replacing a ceiling heater, there’s a good chance that this model will work with the electrical box freed up by the previous model. This model is also compact, only extending 2-3/4 inches from the ceiling. It also comes with automatic overheat protection, which is a great safety feature and extends this model’s life. What keeps this model out of the top three is the fact that it has relatively poor longevity. It usually only lasts two or three years. One part, an electrical fuse, seems to be the culprit. The good news is that part is easily replaceable, but that does drive up the operation cost. It’s also not the fastest-warming model on the market, so it’s not the best for larger bathrooms. The price isn’t too bad, so you’re getting a decent deal for the money, but if you want a model that works well, you’ll probably need to spend more. The Holmes HFH436WGL-UM has some good ideas about how to make bathroom heaters better, but it doesn’t go all the way, leaving users with a product that almost works very well. This model comes with an ALCI plug, which means it’s safe to use in potentially wet conditions. It also comes with a digital thermostat, which means you can set this model to a particular temperature, and it will run until it reaches that temperature, then shut itself off. However, the user interface is tricky. You can set it to run manually, but only for 30 minutes at a time. The interface is also clunky and makes it hard to do simple things. It seems the designers wanted to make a model with more features but didn’t finish the job, resulting in a model that’s hard to use. You also lose any settings you’ve set if you unplug the model, which means you can’t easily move it around to different rooms or unplug it when not in use. If these problems were fixed, it would be easy to rank this model higher on our list. As things stand, it only earns the last place on our list. We hope that our reviews have already given you some insight into the world of bathroom heaters. Like with all electrical appliances, using a heater in your bathroom carries some risk. In this buyer’s guide, we’ll teach you about using these devices safely. We’ll also walk you through the different features you can find in bathroom heaters so that you can choose the model that best suits your needs while getting a great deal on them at the same time. Whether you’ve never owned a heater before or are replacing one for the first time in decades, this guide is designed to help you get up to speed with the latest developments in the heater market, and ensure you get great value for your money. Not every heater is safe for bathroom use. In fact, you’ll find a lot of models warn you that they shouldn’t be used in bathrooms at all. The biggest problem with using any electrical appliance is the risk of it getting wet, short-circuiting, and then shocking you. Accidents like these can be fatal, especially if an appliance falls into the bathtub while you’re in it. So, the first safety steps in using a heater in the bathroom involve keeping heaters away from water. They shouldn’t be used on the edge of a tub or shower, and it’s a good idea to keep them away from sinks as well. A decent away to avoid accidental water contact is to invest in a wall- or ceiling-mounted model. It’s far harder to get these models wet, and if you do, it’s unlikely that you’ll touch them, and it’s hard for these models to fall into a bath or shower. Overall, it’s hard to get shocked by these models. However, not all people will be able to make use of a wall or ceiling heater. You may be in a rental unit, or otherwise unwilling or unable to damage your sheetrock to install a wall or ceiling unit. If that’s the case, you’ll need to invest in a portable model. Portable models are inherently riskier because they can be moved around, and when users don’t take basic safety precautions, they can easily fall into a bathtub or sink. While the best safety precaution is to keep electrical appliances away from water, there are some electrical products that can greatly reduce the change of accidental shock. The first is Ground-Fault Circuit Interrupters or GFCI outlets. You’ll recognize these outlets by their red reset button and black test button. They’re relatively inexpensive and are now required in bathrooms and kitchens in many jurisdictions. GFCI outlets are constantly measuring how much electricity is going through the cable and how much is returning to the outlet. If the amount varies by as little as six milliamperes, the GFCI cuts off the circuit, which stops the flow of electricity and prevents dangerous shocks. While GFCI outlets sometimes have false positives, the most common cause of variance in going and returning electricity is a ground-fault, or electricity leaving an appliance to flow through some other medium, like the water in a bathtub, or you. Using these outlets is a great way to transform a regular bathroom heater into a safer device. The other electrical option is to get an appliance with an Appliance Leakage Current Interrupter, or ALCI component. ALCI-ready appliances work similarly to GFCI plugs. If the appliance detects a change in how much power it’s taking in and putting out, it turns itself off in milliseconds. Generally speaking, GFCI is more common than ALCI appliances, and a regular appliance on a GFCI outlet could be safer than an ALCI appliance on a regular outlet. However, getting an ALCI appliance and attaching it to a GFCI outlet is probably the safest option, as you’ll have two layers of security that would turn the appliance off if a problem ever occurs. There are three common kinds of heaters used in bathrooms: wall-mounted, ceiling-mounted, and portable. Understanding the differences between and benefits of each model can help you get the model that works best for your bathroom. Wall-mounted heaters strike a nice balance between efficiency and safety. This heater type is usually installed within a foot or two of the floor, which means that it can heat the room very quickly. You’ll notice the heat change faster than you would with a ceiling-mounted heater, because the heat starts closer to you, and since heat rises, the room will hit an even temperature much faster. Wall-mounted units are generally easier to mount than ceiling units. If you can find a stud under sheetrock, you know most of what you need to know to install one of these units. Because you choose where you mount these models, you can place them far away from water sources, which greatly reduces the risk of electric shock. Because wall-mounted units are placed in an area that will be easily seen, it’s more important to invest in a model that looks good. After all, you’ll be looking at it a lot, so if you don’t like how it looks, you’ll end up disappointed. Ceiling-mounted heaters mount to the ceiling, as one would expect given the name. They can be further subdivided into two categories: easy-installation and tough-installation. Models that are easily installed tend to hand from the ceiling and use air that’s already in the room in order to heat it. In many cases, they take advantage of standard electrical boxes and are reasonably easy for people with little electric experience to install. The tough-installation models can be a pain to put in yourself, but they often have better overall performance than their easily-installed counterparts. You’ll likely have to cut into your sheetrock with these models, and they tend to require you to do extensive wiring projects. Furthermore, they often require an outside source of air, so you’ll need to create or connect to an exterior air port on the side of your house. If that sounds like something that’s better left to the experts, you’re not alone in that feeling. The good news with these models is that they tend to sit flush or hang just outside your ceiling and provide a good overall look and performance. Portable heaters are easily the most dangerous of the group, but as we covered in the previous section, there are a lot of ways to mitigate your risk. Using a GFCI outlet and an ALCI-equipped appliance can greatly reduce your chance of injury or death due to electrical shock. The nice thing about portable models is that you can generally position them to be closest to the space where you need them most. You can put them near your feet while you get ready for the day if that’s where you’re coldest, or you can put it on a counter to heat that area if the whole room is cold. These models tend to be less expensive than their wall- and ceiling-mounted counterparts, which makes them good for cost-conscious shoppers. They also don’t require any installation, so setting them up is a breeze. If you don’t have the electrical know-how and don’t want to pay an expert for installation, this is probably the best model for you. Heaters are fundamentally changing electricity into heat, and that means the next energy bill you get after installation could be far higher than you expect. If it’s important that you keep costs low, there are a few things you can do to get better value in this area. First, choose a heater with a lower wattage. The more watts a heater has, the warmer it gets and the faster it works, but that also means that it consumes more power. If you’re in a situation where you don’t need the most performance out of your heater, or it’s something that you will only use occasionally, then it’s a good idea to invest in a lower-wattage model. Second, it’s a good idea to choose a high-voltage model if you need to save on electricity bills. A model with double the voltage would use half the wattage, and since you’re billed by the watt, getting a high-voltage model could result in much lower bills. The key thing here is that high-voltage models require different wiring than most appliances in your home, which means you’ll need to get an electrician to wire it if you don’t already know how to do it yourself. Which bathroom heater is right for you? If you want to get a great deal on a bathroom heater, it’s a good idea to look past the price tag for a moment. Good deals are about more than money spent. They also involve the value you get out of your purchase and your lasting satisfaction with the model. So, the best way to get a great deal is to first figure out what your bathroom heater needs to do. Do you want a wall-mounted, ceiling-mounted, or portable model? How fast does it need to heat the room? What safety features does it need? Once you have answers to this question, it’s far easier to get a good deal. Create a list of models that fit those criteria you laid out. Then, choose the cheapest model on that list. It will have the lowest price, but also have all the features you need, making it the best model for your money. The Stiebel Eltron 074058 Wall Mounted heater is our top model, due to its quiet operation, even heating, and the fact that it’s central thermostat ready. 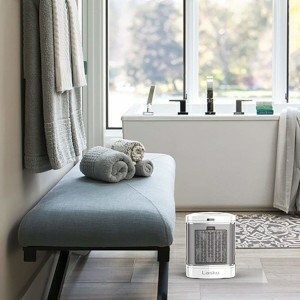 The Lasko CD08200 Portable Bathroom Heater requires no installation, making it the best heater for bathroom use for people who don’t want to mess with electrical rewiring. The Panasonic FV-11VH2 Fan Heater is quiet, energy efficient, and fits in many ceilings, making it a great choice for those who want a ceiling-mounted heater. The Broan Model 157 Bathroom Ceiling Heater has a low profile and fits on standard electrical boxes, but its poor longevity and slow warming drop it to fourth place on our list. 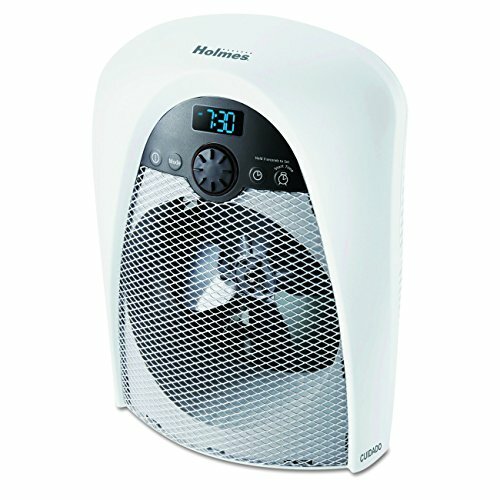 The Holmes HFH436WGL-UM is a decent standalone heater with ALCI protection, but it has a loud fan and tricky interface that means it only earns the last place on our list. We hope that our reviews and buyer’s guide have helped you understand bathroom heaters and safety when it comes to using those models. You should be able to use that information to find the model that is right for your bathroom. Came here looking for a Lasko? 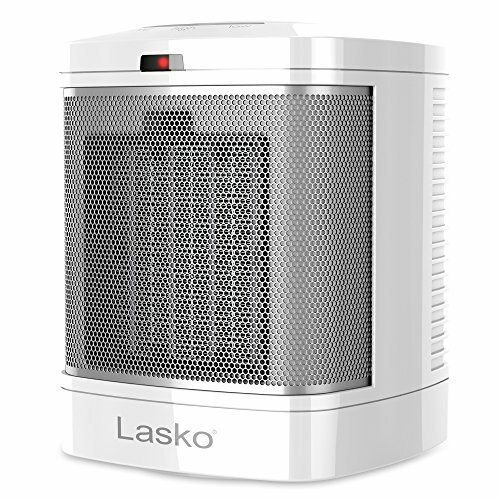 Then see our top 5 Lasko picks here. Micathermic heaters: what are they?